Guwahati: Eminent educationist Professor Srinath Baruah on 5 September 2015 urged the media outlets of Assam to use accurate Assamese words and correct sentences in various items, which are made available to the reader-audience-viewers. Interacting with the scribes at Guwahati Press Club, Prof Baruah also emphasized on maintaining the beauty of Assamese language at any cost for the future generation. 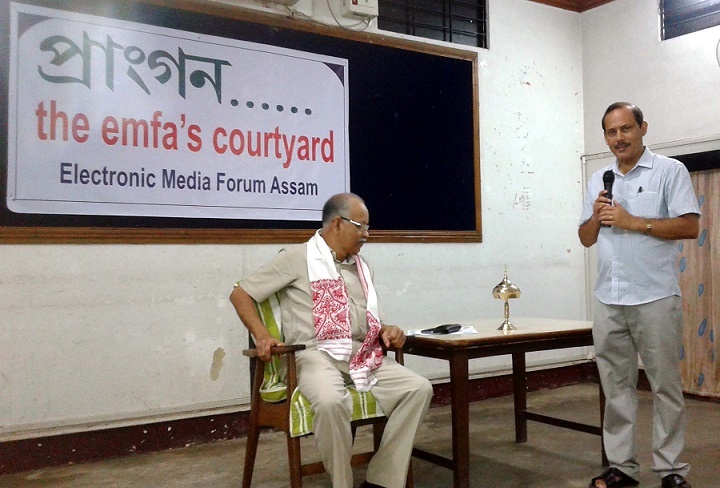 Attending the first ‘Prangon the emfa’s courtyard’ program, organized by Electronic Media Forum Assam, the former vice-chancellor of Krishna Kanta Handique State Open University also highlighted many wrong words, often used in the media that might confuse the audience. Prof Baruah also observed that many news channels have been using the ‘Breaking’ or ‘Big Breaking’ category for wrong news. Moreover, repeated use of unhealthy visuals by most of the news channels was also pointed out by him. He asserted that some news channels have emphasized more on entertaining rather than educating the viewers. Nonetheless he appreciated the role played by Assam based news channels in the time of crisis. Prof Baruah, while highlighting many ethical guidelines for the television reporters from his personal point of views, also emphasized on self-regulation to be adopted by the news channels. He expressed optimism that the visual media would engage more energy on investigative journalism. He also advocates for more space to various northeast India related issues in Guwahati based news channels and urged the media outlets to highlight the international affairs as well for the benefit of their viewers. Prof Baruah also appealed to the news channels to run at last one English news bulletin daily to cater the need of non-Assamese viewers in the region.